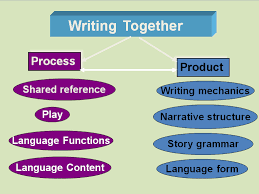 There are many resource write definition about collaborative. In Oxford learner pocket dictionary new edition (2005:77), collaborative is the verb from collaborate. Collaborate means work together. In addition, Jeremy Hammer (1991: 119) states that “collaborative is students gain a lot of from constructing texts together”. According to Van Pelt, et al (1991:284) in Astuti Aziz state, classrooms facilitate such collaboration and thus encourage the student's intellectual maturity. In classrooms especially, therefore, collaborative exercises have unique pedagogical merit, introducing students to the environment and practices of professional technical writers while also developing students' intellectual and interpersonal abilities. According to the Hancer (1979 : 35 ) in Jenny Thomas that write have observed that some per formatives do not have felicity conditions in the sense that a specified person must utter the words in particular circumstance, but nevertheless their success is not guaranteed. They require, of their success the collaboration or particular uptake of another person. In a true collaborative environment, each contributor has an almost equal ability to add, edit, and remove text. The writing process becomes recursive a task, where each change prompts others to make more changes. It is easier to do if the group has a specific end goal in mind, and harder if a goal is absent or vague. A very good method of discussion and communication is essential, especially if disagreements arise. Successful collaboration occurs when each participant is able to make a unique contribution toward achieving a common vision or goal statement. Supporting this common goal are objectives that have been generated by each of the participants. It is important for each participant to "feel" as though he or she has a significant contribution to make to the achievement of goals. It is also important that each participant be held accountable for contributing to the writing project. Brown, C. A., 2007, East Carolina University. Collaborative writing can lead to projects that are richer and more complex than those produced by individuals. Many learning communities include one or more collaborative assignments. However, writing with others also makes the writing task more complex. Belum ada tanggapan untuk "COLLABORATIVE WRITING IN WRITING"